Click on one of the above to go to that group of hills. 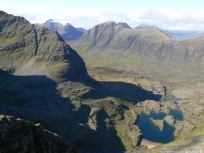 Sir Hugh Munro set himself the task of identifying all the Scottish Mountains. He defined a mountain as being at least 3000 feet high, and reasonably separate (unfortunately he gave no clear definition of separateness!). The 3000 feet (914.4 metres) height is remarkably successful at capturing most of the best mountains. By the way, in spite of Munro’s efforts, we traditionally call all Scottish mountains “hills” (in Ireland all hills are called mountains! ); but many of our hills should be thought of as genuine mountains even if they are not as high as foreign ranges: they are steep, rugged and difficult enough. 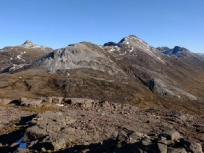 Over 5000 people have now been to the top of all the 282 “Munros”. This game is often criticised as mere list-ticking which detracts from the beauty and interest of the hills themselves. But few “Munro-baggers” are so simple-minded. 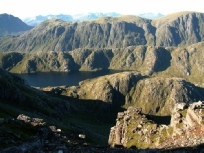 The Munro list provides an incentive, but the reward is not only that tick; it is rather the experience which it encourages of a great variety of hills, landscapes and weather conditions, all over the country, which can only teach a love of the outdoors and of the hills themselves. Scotland is probably the best country in the world for hill-walking, because its hills are so varied and are not too inaccessible, high or (mostly) technically demanding; the challenge of climbing all of the highest hills is a hugely enjoyable and rewarding one. And then there are the Corbetts (2500-2999 feet) and the Grahams (2000-2499 feet)! Having climbed the Munros three times and the Corbetts once, I still feel able to deny that I am (or was) a “bagger”; summit-bagging was the least important reason but a valuable incentive for climbing hills (and a good way of choosing where to go next!). These pages do not tell you how to climb the hills; there are plenty of guidebooks. Our hills are not easy. 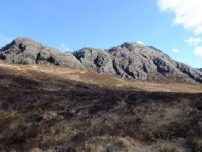 There is a lot of rock on them; they tend to start close to sea level; they are usually steep, both in ascent and in descent; many involve a long approach walk, including the remotest in the country; the terrain is often rough. These pictures give some idea of the scenery, but they are of relatively low quality; for higher definition see the real thing! Hills are not for everyone! Not all will enjoy the thrill of scrambling along an exposed rocky ridge. For many the view from the road will be enough, and the effort involved in climbing to the tops will seem pointless. (Who is to say that they are wrong, from their own point of view? - see “Out of the Cave” on the Personal page!) 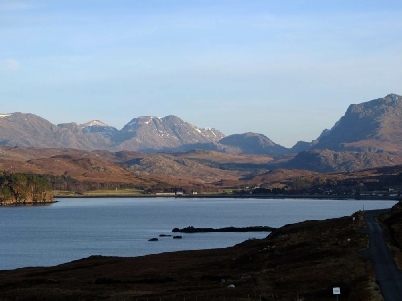 Indeed, Wester Ross is rich in roadside views, such as the two below.